Let’s Create Dream Candy House! Today, I would like to introduce an article about an event to make a candy house. I assume that many of you must have read the tale of Hansel and Gretel, and dreamt of having your own candy house once:-) Creating candy house may sound very pretty and may even remind you of festive decoration for the year-end event, but this even is actually not all about cuteness! 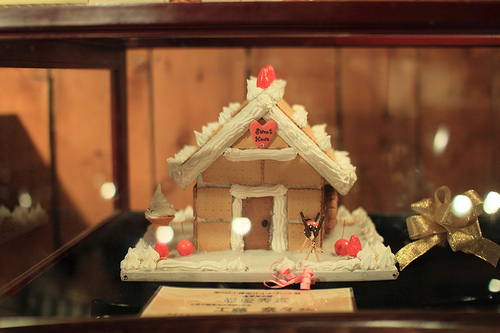 According to the article, it seems there is a candy house making workshop held at some shopping malls in Japan. This workshop is organized by a real estate group in corporation with a sweets manufacturer as part of reconstruction support project for Great East Japan Earthquake, ‘Egao wo kokokara Reconstruction Support Project (or Prompt a Smile Reconstruction Support Project)’. You can join the session to create your own palm-size candy house for 500 yen (equivalent to US$ 6.50). Good thing about this workshop is that this 500 yen not only gives you an opportunity to entertain yourself by making your dream come true, but also gives a candy house making kit to those children who have been suffering from the earthquake. It may be a small thing, but it must be very nice if we could share such a happy moment with children in East Japan and bring them big smiles to their faces. The power of sweets is great! !